Fr. John Gathungu was ordained on January 1, 1990. He served in a variety of parishes in Nyeri, Africa, including at a Pastoral Center, before he went for further studies in 1993 at The Catholic University of Eastern Africa. He graduated with a master's degree in Religious Studies in 1996. He served as Catholic Education Secretary while residing at Our Lady of Consolata Cathedral in Nyeri. 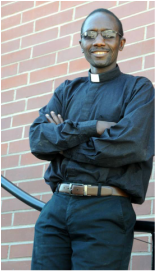 In 2002, he was serving two parishes and in 2004, he volunteered to serve four years in the Diocese of Lodwar, including time in the Kakuma refugeee camp. He worked in other local communities and later was appointed diocesan Pastoral Coordinator. In 2008, he came to Idaho, residing at St. Gertrude's Monastery, and later in Holy Trinity Station in Nezperce. He was parochial vicar at Our Lady of the Lake Parish, McCall; St. Katherine Station, Cascade; and St. Jerome Chapel, Riggins from 2011-13. He was administrator at St. Mary Immaculate Parish in St. Maries and in Our Lady of Perpetual Help in Harrison from 2013-15. ​Rhett Mahoney has been a certified public school teacher for 18 years in Moscow (2), Genesee (3), and Lewiston(13). He has a Bachelor’s Degree in Education with an Art Major and Minors in Math and Architecture and a Master’s Degree in Educational Technology. Rhett has been a basketball coach, and official, and is currently the Basketball Officials Commissioner for Idaho District II. His family includes his wife Myja, and daughters Sophia and Mae. The family enjoys the hobby farm of 1 horse, 1 dog, 2 goats, and 16 chickens. They feel blessed to live in Idaho and enjoy most of the available outdoor opportunities. Teresa Groom has been a part of the SPPS staff since 1990. She has been both a part-time and full-time teacher at SPPS and as both principal and assistant principal. Teresa graduated from the University of Idaho with two BS degrees: one in Elementary Education and the other in Child Development and Family Relations. She later earned a Master's Degree in Educational Leadership from the University of Idaho. Teresa is both a certified teacher and a certified principal in the State of Idaho and also received her certification to teach religion from the Diocese of Boise. Her husband, Rob, is an alumni of Saints Peter & Paul School and all four of their children are also graduates of SPPS. Click here to read why the Grooms sent their four children to SPPS. Jenna graduated from Prairie High School and then earned her BS degree in Elementary Education with a minor in Reading from Lewis-Clark State College. She is a certified teacher in the State of Idaho and also received her certification to teach religion from the Diocese of Boise. She began teaching at SPPS in 2008 and her favorite subject to teach is religion. She and husband, Matthew, have five children. Natosha graduated from the University of Idaho in December, 2013, with a Secondary Education degree in Language Arts and is certified to teach secondary Language Arts in the state of Idaho. Originally from Ferdinand, she was a member of Assumption parish, educated in the Cottonwood School District and attended 12 years of their Release Time Religion program. Natosha is married and has two children. Teresa graduated from Humboldt State University with a BS degree in Natural Resources Planning & Interpretation. She worked for the National Park Service for six years and still gives tours of the White Bird Battlefield to our 3rd & 4th grade students during their Idaho History study unit. She has worked at SPPS since 2000 when she began as a volunteer librarian. She was hired part-time to oversee the computerization of our library and has worked as our librarian ever since. She also works as a Title I aide and a teacher's aide. In 2000, she became the school's Recycling Coordinator and continues to volunteer in this program. She began the ink recycling program at SPPS and funds from the program are used to purchase library books. Teresa and husband, Garry, have three sons; all of whom have graduated from the school. Penny Stuivenga has been part of the SPPS family for 48 years. She is an alumni of the school as were all of her brothers, sisters and her three children. During the time her children attended, she served on the School Board, Home and School Board, and put in many hours volunteering. She worked as a teacher's aide for two years before being hired as our school secretary in 2006. Penny stated, "I love this school. I love seeing it grow and I love seeing our students excel in their lives because of it." Click here to read about Penny's decision to send her children to SPPS.